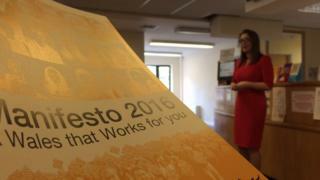 The Welsh Liberal Democrats' manifesto: What's in it? On Thursday the Welsh Liberal Democrats became the second party to launch their Assembly election manifesto after Plaid Cymru launched theirs the week before. And it's another large document - more than 100 pages long in its full form. At its heart, though, are three main themes the Lib Dems want to hammer home to voters. Kirsty Williams doesn't pretend she could lead a government, but if a potential first minister wants her help - another minority Welsh Labour government, perhaps - then these are the kind of things she will want in return. The three big pledges amount to two specific policies and one broader idea. The Lib Dems say they'd ensure more nurses on Welsh hospitals wards. They would expand the Lib Dem-backed Nurse Staffing Levels Act to mental health wards and community care teams. There is no figure for how many nurses would be provided - the concept is around the safe level of nurses and that depends on circumstances of what is required. The Liberal Democrats' big education platform is a very specific one - the party says it would reduce infant class sizes so they contain no more than 25 pupils. The policy would apply to reception, year one and year two, with a reduction grant of £42m available over the assembly term. The figure is based on a previous Welsh Liberal Democrat policy the last time they were part of government in Wales, and adjusted for inflation. And there's a package of ideas under what the Liberal Democrats call building an "opportunity economy" - with plans for affordable housing and more apprenticeships. The Lib Dems would fund 20,000 extra affordable homes by 2021, increasing the social housing grant from £35m to £75m per year. That would amount to a doubling of the current Welsh Government target of 10,000 new affordable homes. Lib Dems have said they'd fund the proposals using new borrowing powers and scrapping plans for the M4 Relief Road which would save £12m a year, according to their own figures. The party is also promising to create tens of thousands of new apprenticeship places. What else is there on health? The NHS has always been a signature issue for Kirsty Williams. As well as the nursing pledge, the party would also invest £10m in a GP access fund to extend opening hours and find "innovative ways" of providing care services. Ms Williams' party also says it would end mental health discrimination, legislating to put mental health care on an equal footing with physical health, and reduce waiting times. The Lib Dems would also set up a "all-party and non-party" commission on the NHS's long-term future in a bid to stop the issue being a political football. The party is hoping to expand their pupil premium policy - added cash for children from disadvantaged backgrounds that the party had secured from the Welsh Government. It would increase the Early Years Pupil Premium every year to reach £1,000 per eligible child by the end of the next term. Lib Dems plan to end the tuition fee support grants that students currently get, which the party says is draining universities of funding. They would replace it with a student living support grant funded by the other grant's withdrawal. Offer ten hours a week of free, quality childcare to all working parents from the end of paid parental leave until their child is two. Offer ten hours a week of free, quality childcare for all children aged two to three by removing childcare from Flying Start and reinvesting the funding in "more flexible, universal provision"
The Lib Dems say they would scrap the enterprise zone policy of Welsh Government, which they say has failed to deliver. Instead, the party would introduce "growth zones" providing tailored business support. Meanwhile areas that suffer sudden economic shocks, such as Port Talbot, would benefit from the creation of development companies. The Lib Dems say they would improve infrastructure on the A55 to bring it up to standard, and oppose the Black Route development of the M4 relief road. The Black Route is the Welsh Government's plan for a six lane motorway south of Newport. The party says it would implement alternative approaches to tackle congestion, such as improving the "distributor network" around Newport - understood to mean something similar to the 'Blue Route' proposal which upgrades existing roads. The Lib Dems says they'd enshrine renewable energy and green house gas targets in law, setting a target for net-zero greenhouse gas emissions by 2050. Under the heading 'preparing for the worst', the party says it must prepare communities to protect themselves from climate change's effects. Initiatives include offering grants to householders to defend against a future flood event. The manifesto suggests that, as things stand, the Lib Dems are not keen on the Welsh Government's plan to merge councils into eight or nine areas. "Without introducing a fair voting system and devolving powers to local communities, any reorganisation process is pointless," the manifesto says. The current Welsh Labour Government wants to set up new authorities roughly along the lines of the former county council areas. The Lib Dems say Wales has too many councils, but adds they don't think the return of Dyfed and Gwent meets any "recognisable definition of local". They say the commission the local government and boundary should be tasked to draw up alternative proposals based on "natural communities", and that a Single Transferable Voting (STV) system for local elections should be introduced. It remains difficult to see how the Lib Dems could do a deal on council mergers without STV being introduced. The Lib Dems say they would not increase income tax, and over the long-term reduce the income tax burden for low and middle income earners. A pledge to reduce the basic rate of income tax by 1p has been purposely left out of the manifesto, mainly because of the uncertainty around when the powers would be devolved. The Liberal Democrats backyard is mid-Wales and it is no surprise that there are a raft of policies aimed to tackle agriculture and rural issues. What else does it promise? Plaid Cymru's manifesto: What is in it?